Hello fellow modelers and dear friends. It’s been a long, long time since I’ve posted anything. But after attending model shows and judging plenty of models during the past few years I decided to put an article together on how models are judged in the hopes that it will help those modelers preparing to enter their models in contests. Modeling has always been a very personal hobby and when you build your model as long as you like what you build, that is all that matters. However if you like to attend model shows and enter your models into the contests that are frequently held and get away with a price you need to step beyond the boundaries of what is acceptable for you and see how others look at entry models. Especially, the most important of spectators, the judges. All the shows I have been judging are IPMS shows so the follow the judging rules of the IPMS. Things may be different from show to show, especially small, local events but in any case these guidelines are pretty useful to keep in mind when building a model that you intent to enter in a contest. Here are some of the most important things that judges look for when looking at a model. 1) Back to basics – Basic construction is the most important thing that judges look at. 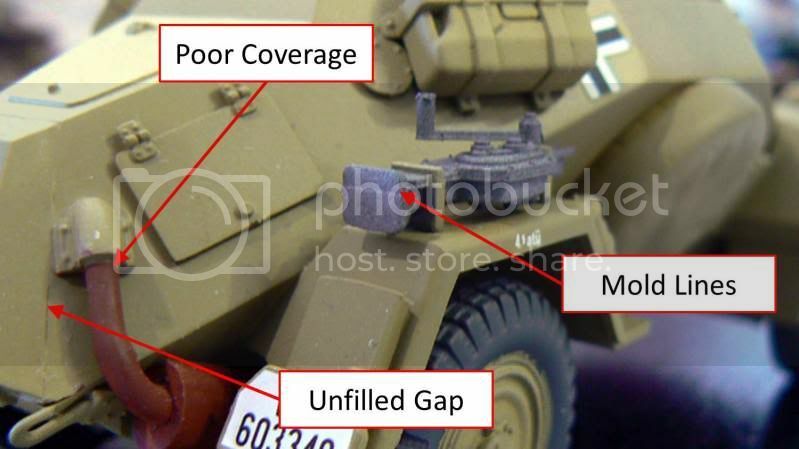 Things like mold lines, gaps that are not filled (and are supposed to be), gaps that are filled (and are not supposed to be), glue spots; sink marks, ejection marks, alignment of parts, etc. This is the most important thing to keep in mind as a mistake here will set you back no matter how good your model looks overall. 2) Consistency – This basically means that the finish on your model is even throughout the build. If you weather some parts really well and you leave other similar parts untouched that would not be very consistent. 3) Basic paint – The way paint is applied is very important. Not as important as basic construction but it still worth taking your time. Things like sloppy paint jobs, or poor application can set you back. 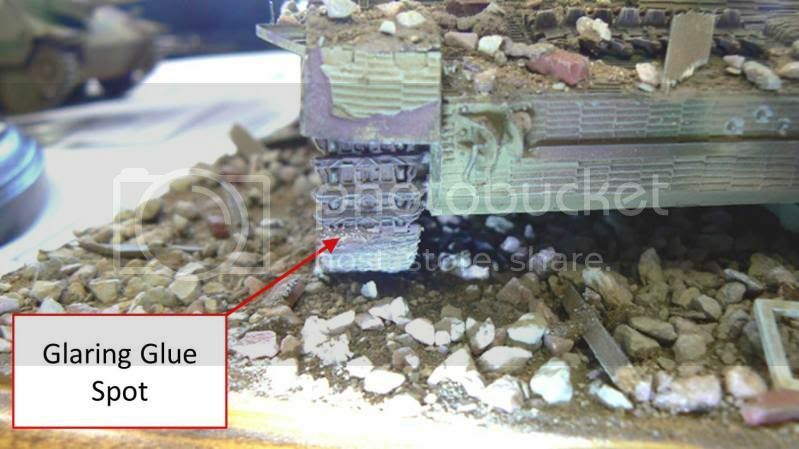 4) Weathering and Finish – Weathering is one of those things that while is very important to most modeler it will not sell your entry right away. 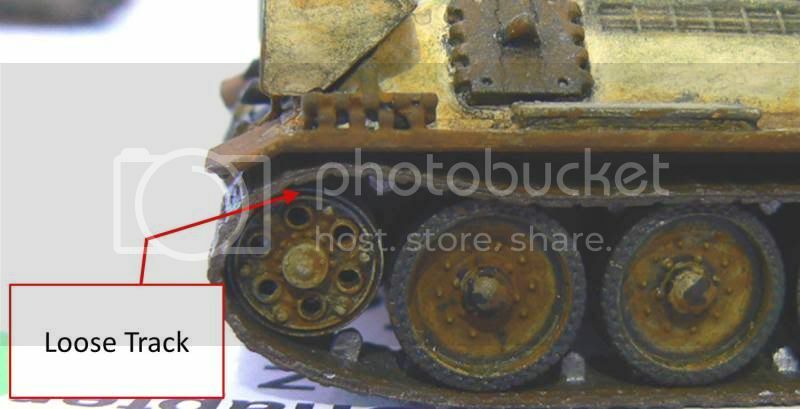 An effective weathering may look good to the judges but what they look for is the answer to the question, “did the modeler pulled off what he attempted?” In other words if he presented a brand new vehicle, is the weathering appropriate? If he builds a battle tested vehicle, does the weathering supports that? 1) Bare Plastic – This is a common flaw especially for those (like me) who like gluing all parts prior to painting. It is considered a basic painting flaw and while not as critical as a construction flaw it takes a lot away from your overall finish. I know is hard sometimes to get paint in all those nooks and crannies but if you like gluing all parts before painting make sure you go over with a brush or apply dark washes to those corners to avoid this. 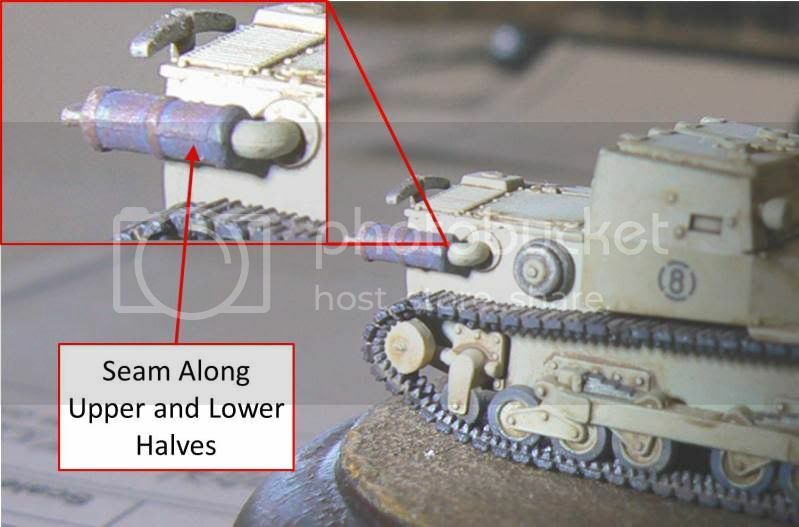 2) The Seam line – Many times when we have parts that come in two halves is hard to get rid of that seam line that results where the two halves meet. This is true especially for round and cylindrical parts. Take your time and use putty if necessary and a good sand paper to get rid of these. These are major sins in the judges’ book. 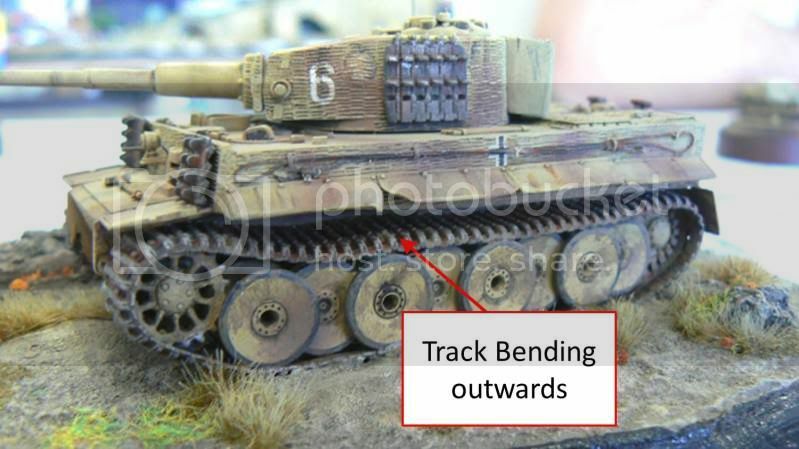 3) Bent and Uneven Track – This is the number 2 reason why tracked models get disqualified (no. 1 been floating road wheels, more on that later). This happens when the track bends either inwards or outwards creating unnatural waves in it. This is hard to avoid especially with vinyl or the soft styrene type tracks. 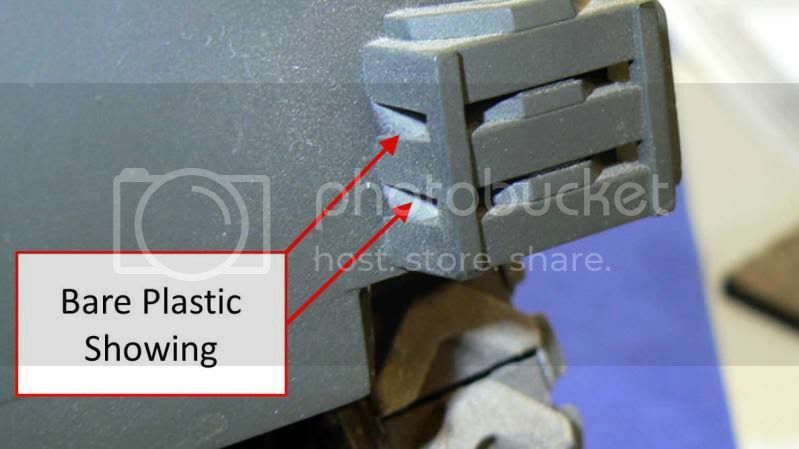 4) Mold Lines – Every part made by injection molding has a mold line. This is an inevitable process or casting and in fact it would be impossible to produce injection molding 100% free of mold lines. While lately slide molding technology has brought us parts with very little mold lines, care must be taken especially with small parts while construction. 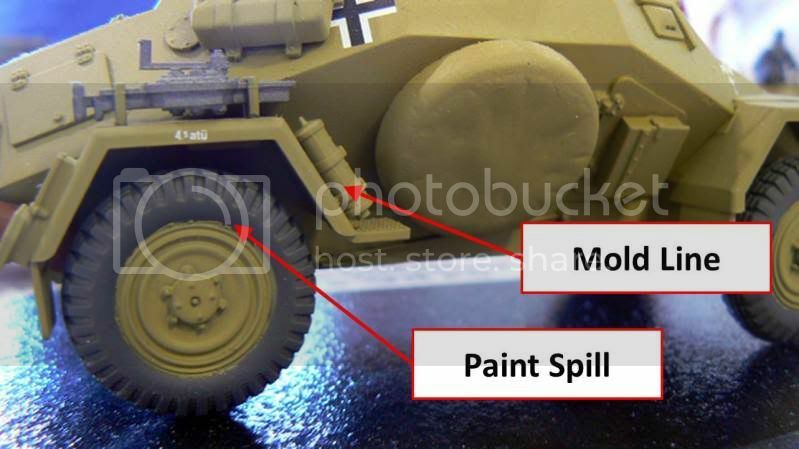 5) Paint Spill – Considered a major mistake on basic painting skills. Paint spills into adjacent parts can really take away from your model. 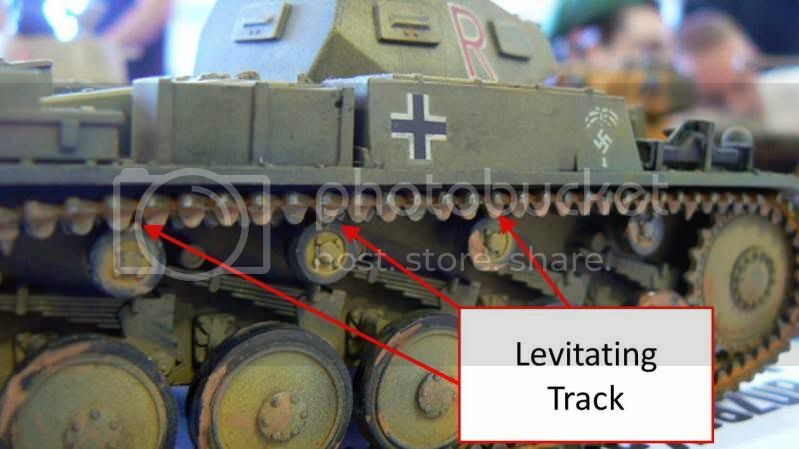 6) The Levitating Track – This one is a personal pet peeve of mine. The levitating track happens when the track seems to float on top of the return rollers. A track is a very, very heavy object and it is supposed to be supported by the return rollers. Make sure that when you install track it is pressing tight against those rollers. 8) Loose Tracks – This happens when a track is not tight enough, especially around the sprocket and / or idler wheels. This is hard to avoid when using one piece vinyl tracks and sometimes with link by link tracks as well. 9) Glue Spots – The next time you glue a part and tell yourself, “nobody will see that”. Trust me, they will! Glue spots are one of those things that will boot you out of a top spot so fast that I have to stress it. Once you finish your model, look it over and look it over. If you know that you have glued any parts go over the area with some matt varnish. This will make the shining glue spots go away. 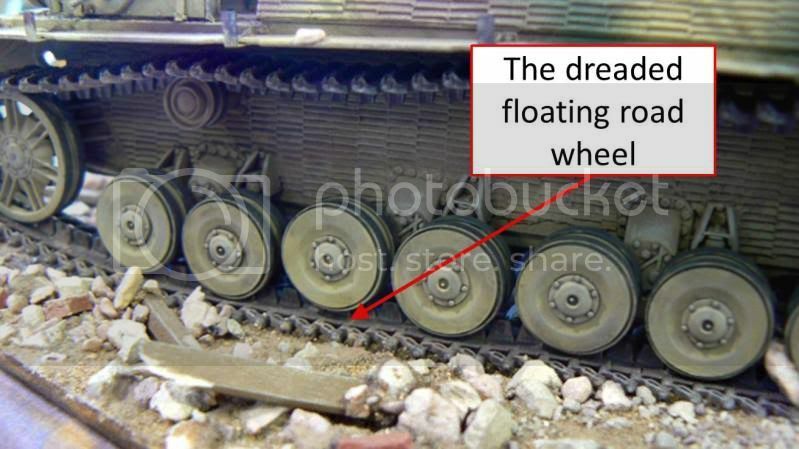 10) Floating Road Wheels – This is the deal breaker!! I have seen so many nice looking models disqualified because of this that I think is a must for armor modelers to take a second and third look when putting together running gear. I usually check before gluing the tracks and my test is if a sheet of paper fits between the road wheel and the track, that way too much space. Well, there you have it. Those are the most common mistakes that will get an armor model out of the race pretty fast. I hope you have found this article useful and will give you a perspective on what to avoid if you are planning to build an armor model for a contest. Until next time... Model on!! Dave, while I have never competed I a looking to take part in my first ever competition next april, I found your entries to be both interesting and informative. If you have any other info/tips I for one would be most interested in reading them. You are welcome. Here are a few other things I think you should keep in mind. I hope these help you. The Tracks! The Tracks! The Tracks! I will say this again and again. If there was one thing I would have to pick the number one issue that bugs modelers I’d have to say is problems with the running gear. During this past weekend at Nationals of all the tracked models I had to judge 95 % were eliminated due to flaws in the tracks and road wheels. Pay attention to how the tracks look. Remember, tanks weigh tons so the tracks need to reflect that. Things like crooked tracks where one side is further in toward the vehicle than the other, or floating tracks, where a track does not touch the return rollers are things to watch out for. Also pay attention to your road wheels, a crooked road wheel is enough to kick you out of the race. Most modelers think that in a contest environment the most impressive model wins. That is true most of the time, what is not true is the assumption that in order to make an impressive model you have to add every aftermarket part you can imagine. What adding extra parts does is basically giving you more room to make mistakes. So, given that, if you plan on adding aftermarket parts, take your time to make sure you are not adding flaws that could be avoided if you leave the aftermarket out. If a model is to win at a contest it must be 100% accurate, right? This is another myth that most modelers assume is true. The answer is that accuracy is only taken into account in the case of a tie where two models have no construction or painting flaws. Otherwise it doesn’t matter if your OD green is not exactly the right shade, or if your tool bracket has 2 bolts instead of 3. So don’t waste your time adding details to make your model more accurate. You are better off concentrating on your construction and painting. The other extreme is just as bad though. Don’t build a flawless Canary Yellow Panther and expect to win. Know what Category you are shooting for. If you are building a model for a contest, it helps to know ahead of time what category you are planning to enter. Many contests have special rules for each category and is good to know ahead of time so your model does not get moved at last minute and you end up in a category you are not ready for. A good example of this is, if you are adding a figure, most contests only allow one figure and it has to be part of the vehicle’s basic crew. If you have too many figures the entry is considered a diorama. Another example is a lot of contests have special prices for best “Out of the Box” model, but in order to qualify you have to bring a copy of the instructions and attach it to your entry form. A good thing to do is get a copy of the contest rules and read them ahead of time. Some contests allow “Sweeps” (A sweep is where the same modeler may place with more than one entry in the same category) most contests don’t. If you happen to enter more than one model in the same category all the judges will do is pick the best of them, so you will be essentially competing against yourself and reducing your odds of placing in other categories. That’s why is important to know what category each of your models is going for. Is better to have three models in three categories and have three chances at winning than only have one chance. Again, read the rules before hand. I hope these tips are helpful to all of you who are planning to enter contests. If you have any specific question related to what you are building don't hesitate to send me an email or post it here. 1. OOB (out of the box), don't forget your instructions. They must be there as sometimes they help us determine if a builder modified their kit or not (a big boo boo if they did). Case in point, we judged two entries built OOB. They were the same kit but one had head lamps and the other did not. What gives. Well we turned to the instructions to see who was right and it turns out they both were, the head lamps were optional as per the instructions. There were several kits at the last Nats that were disqualified out right for lack of instructions (and they may have placed). If you forget your instructions then place the model in the non OOB catagory, that way at least they will get looked at by the judges. 2. NOTES, this can be important as not all the judges are experts about everything armor. If there is something different about your model that you think might have the judges scratching their heads then make a note of it on the entry form. 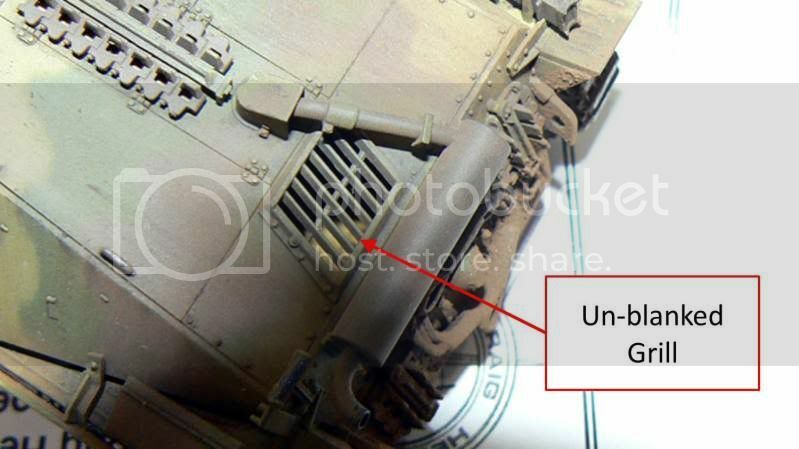 If your tank has tracks that were installed backwards and you have photo proof of it then make a note of it on the entry form with either a picture or some other ref. such as book title with page number. Just remember what David said earlier. Basics, it is the basics that kill a model just about everytime. Pre judge your model before entering. There are two ways you can do this. One is taking pictures of it and looking at them on your computer and the second method is to look at it in a mirrow. You would be suprised what you will notice. That is a good question Steve. The only thing is that the answer may not be as exciting as you may think. The answer is: it depends. This is because judging is done (at least in the IPMS) in stages, or what some judges refer to as “rounds”. As you begin the process is very cut and dry but as you progress it becomes less mechanical and more artistic. For example, if the person tried to show a rusty exhaust, there is no right or wrong way to do that as in real life there are hundreds of different ways rust can show. Instead, you judge on how well the effect was achieved. Also at this point the level of work involved in the model is taken into consideration. After that you’d have to look at accuracy, but I have to admit in 20 years I have yet to see a tie breaker decided on accuracy alone. Thank you David. This is great help. I, like David, have yet to see a tie breaker come down to accuracy. There will usually be something that sets one apart from the other. This is one of the reasons I do not like the current 1st, 2nd and 3rd place type of competition we hold at IPMS Nationals. I prefer a Gold, Silver and Bronze type of finish where your model competes against a points based standard. Where your model places is determined on how many points it has. You can have several golds, silvers and bronzes all in the same catagory or none (I've seen 1st places go to models at IPMS Nats that wouldn't get a bronze in an AMPS event).